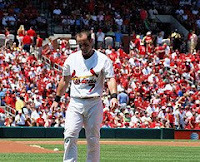 Adam Kennedy was released by the St. Louis Cardinals today, surprising Cardinal Nation after the team had let go of second baseman Felipe Lopez and utility infield specialist Aaron Miles. The Cardinals will assume $4 million in salary, making the sudden move all the more shocking as team ownership has been crying poor for most of the hot stove season. According to the St. Louis Post-Dispatch, manager Tony La Russa felt Kennedy's presence at Spring Training in Jupiter, Florida was going to create an unwanted distraction. Although the best candidates for a starting second baseman are now out of Cardinal red, the squad as plenty of prospects. Considered the leader amongst them is Brendan Ryan, who has more major league time than the rest of the list, which includes: Brian Barden, Tyler Greene, Joe Thurston, Jarrett Hoffpauir and Skip Schumaker. Schumaker's working out at second base seems to have plenty of significance, but I had thought the trial was more to make sure of his ability (or lack of it) to field the position. Thus, giving the Cards' ownership a clear idea of whether they might want to go after Orlando Hudson. It is thought by some that the Cardinals would not want to assume Kennedy's salary, plus an equal to greater salary for a player of Hudson's caliber. That thinking could still be on target, but when the release of Kennedy is considered, the odds of extending toward the acquisition of a player like Hudson increase, if only by a little. If there is any piggyback move to be made, you would think it would occur right away, or very soon. The absence of any such move is probably an indication that the Cardinals indeed are going to let their bevy of prospects fight it out for second base during Spring Training.